The Alameda County Sheriff's Office (ACSO) is a law enforcement agency serving Alameda County, California. ACSO is accredited through the Commission on Accreditation for Law Enforcement Agencies (CALEA), the American Correctional Association (ACA), National Commission on Correctional Health Care (NCCHC) and the California Medical Association (CMA). 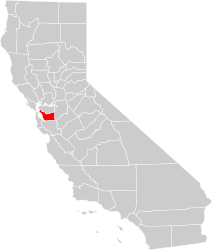 Map of Alameda County Sheriff's Office's jurisdiction. As of 2008, the ACSO has approximately 2500 positions, over 1,500 of which are sworn peace officers. The sheriff coroner is an elected position currently filled by Sheriff Gregory J. Ahern. The previous sheriff, Charles Plummer, served from 1987 to 2007. The Alameda County Sheriff's Office operates two detention facilities. The Santa Rita Jail, located in Dublin, California, is the primary facility that houses most people arrested or convicted of crimes in Alameda County. The Glenn Dyer Detention Facility, also known as the North County Jail, houses a smaller number of inmates and is located in Downtown Oakland. The Alameda County Sheriff's Office operates a police academy and training exercises for the greater law enforcement community in the Bay Area. Developed by former Alameda County Assistant Sheriff James Baker, Urban Shield is a weapons expo and first response training exercise that began in 2007. The goals of the program are to prepare law enforcement tactical teams, including SWAT teams, to respond to crises and coordinate efforts between law enforcement, fire personnel and medical personnel. An additional purpose is to assess the policies, procedures, organization, equipment and training of attending personnel. Hosted in the San Francisco Bay Area by the Alameda County Sheriff's Office, Urban Shield is the largest urban full scale readiness exercise in the United States. Police, fire, HAZMAT, EMS and EOD teams from all over the nation train in multiple scenarios over a continuous 48-hour program. In the first year, scenarios included an active shooter on the UC Berkeley campus, an airplane hijacking, a maritime interdiction, and a 20-mile hike. Since 2012, the Bay Area UASI tests portions of the Regional Catastrophic Preparedness Grant Program as part of the full scale readiness exercise, such as the regional mass fatality plan. Urban Shield is primarily sponsored by the Department of Homeland Security, and receives additional support from the Bay Area Urban Area Security Initiative, which had a 2014-2016 budget of $6,358,300 from San Francisco City and County funds. $4,901,339 of this was allocated to “Enhance Homeland Security Exercise, Evaluation, and Training Programs,” including management, oversight, and support of the Urban Shield conference. Private corporations including Verizon Wireless, Motorola, Sig Sauer, and Uber offer services and equipment in support of the event, and additional funding comes from private weapons manufacturers such as Lenco and Lockheed Martin. In the past, these manufacturers served only the Pentagon, but have expanded sales to civilian police departments and SWAT teams in recent years. Numerous first responders from around the county and the world have participated in or observed Urban Shield. It has attracted international SWAT teams, including those from Singapore, South Korea, Israel, and Bahrain in 2014. In 2010, 2011, and 2013 Israeli elite counter-terrorism unit Yamam won the exercise, breaking and setting records. Boston police commissioner Edward F. Davis credited Urban Shield with helping prepare the Boston Police Department for their response to the Boston Marathon bombing. There have been protests against Urban Shield prior to and during the event every year since 2013. In 2013, the Urban Shield training program was controversially held on the second anniversary of the removal of Occupy Oakland from Frank Ogawa Plaza. Community activists such as the Stop Urban Shield Coalition recognize Urban Shield as part of a trend of global militarization and escalated police intervention on civilians. Activists also have concerns about Urban Shield expanding direct militarization through increased weaponization, given that Urban Shield includes a major arms expo where vendors market advanced, military-grade technology to the SWAT teams and police departments in attendance. In 2014, activist pressure over Urban Shield led to Mayor Jean Quan's announcement that Oakland will not host the military weapons expo in 2015, marking the first such move since Urban Shield started in 2007. The following year, the 2016 Urban Shield conference was held at the Alameda County Fairgrounds in Pleasanton, CA and was also opposed by protestors, 20 of whom were arrested for trespassing and obstruction. Protesters expressed that the technology showcased at Urban Shield promotes police surveillance and control that specifically targets poor people and people of color. The demonstration included performances and speeches to resist the repression. The Alameda County Sheriff's Office operates a police substation in San Leandro, near John George Psychiatric Pavilion, and a juvenile detention center. The Alameda County Sheriff's Office operates a crime laboratory that is accredited by the American Society of Crime Laboratory Directors. The crime lab, located at the Eden Township substation, receives and analyzes evidence from law enforcement agencies throughout Alameda County. The crime lab has capabilities in controlled substance analysis, latent fingerprint recovery, ballistics, tool mark identification, and DNA extraction and analysis. Crime lab staff can also serve as crime scene investigators upon request by law enforcement agencies in the county. The Alameda County Sheriff's Office operates the coroner's bureau in East Oakland. Coroner's pathologists, deputy sheriffs, forensic death investigators, and sheriff's technicians assist law enforcement agencies to determine the cause and manner of death of persons in Alameda County. Additional duties include notifying next of kin, and when needed, the seizure and protection of decedents' assets. In special circumstances the ACSO decides when to refer cases to the public administrator, such as when next of kin cannot be located. In early 2013, Ahern was one of the first law enforcement officers in California to propose purchasing an unmanned aerial vehicle (UAV). Opponents petitioned the purchase, and formed the organization Alameda County Against Drones (ACAD). The ACAD gained nationwide attention resulting in the board of supervisors failing to approve the purchase. With the June 2014 election, a group called "Elections for the People" expressed concern that for many decades the position of sheriff, while elected, has not been a contested election. The current sheriff, Gregory Ahern, was selected by the prior sheriff, Charles Plummer, and has run twice, unopposed. The 2012 salary for the sheriff of Alameda was over $547,000; this included a base salary of $267,871 and other benefits and payments. On November 12, 2015, 29-year-old carjacking suspect Stanislav Petrov was pushed to the ground and beaten with batons by two Alameda County Sheriff's deputies, in an alley in San Francisco. The beating was recorded on film. On May 10, 2016, the two deputies were charged with assault with a deadly weapon and battery and assault under color of authority. During the Free Speech Movement riots of the 1960s, the Alameda County sheriff deployed several squads of deputies. Clad in light blue jumpsuits, they quickly became known by anti-government protesters as the "Blue Meanies". In November 2010, October and November 2011, and January 2012, Alameda County sheriff's deputies were requested by the Oakland Police Department and supplied by the sheriff to assist at protests. Activist Stew Albert ran for sheriff in 1970, garnering 65,000 more votes than the previous sheriff, who had supervised his incarceration. Most of the cities within the county have their own police forces, including the Alameda Police Department, the Berkeley Police Department, the Oakland Police Department, the San Leandro Police Department, the Hayward Police Department and the Fremont Police Department. The municipal police departments provide routine law enforcement services for those cities, with the ACSO providing corresponding services for unincorporated regions of Alameda County and the city of Dublin. ^ O’Brien; Weiss; Davis (Spring 2015). "Urban Shield". Journal of Counterterrorism and Homeland Security International. 21. ^ a b c d Bauer, Shane (December 2014). "The Warrior Cops Suit Up". Mother Jones. 36 (6): 18–23. ^ a b Doherty, J. (Spring 2016). "US VS. THEM: THE MILITARIZATION OF AMERICAN LAW ENFORCEMENT AND THE PSYCHOLOGICAL EFFECT ON POLICE OFFICERS & CIVILIANS". Southern California Interdisciplinary Law Journal. 25 (2): 1–51. ^ "Supporting Agencies". Archived from the original on 2017-03-21. ^ Rahall, K. (Summer 2015). "The Green to Blue Pipeline: Defense Contractors and the Police Industrial Complex". Cardozo Law Review. 36 (5): 1785–1835. ^ "'Urban Shield' Officer Training Event Greeted By Protests In Downtown Oakland". Retrieved 2017-04-26. ^ "Police Militarization Opponents Protest 'Urban Shield' Training Exercise In Oakland". Retrieved 2017-04-26. ^ "Oakland Residents Respond as the Largest Police Training in the World Invades". The Nation. ISSN 0027-8378. Retrieved 2017-04-26. ^ a b "20 Arrested During 'Urban Shield' Protest". NBC Bay Area. Retrieved 2017-04-26. 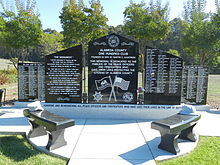 ^ "Urban Shield - Oakland - LocalWiki". Oaklandwiki.org. Retrieved 2016-05-04. ^ Pilkington, Ed (2014-09-08). "Urban Shield: after Ferguson, police and suppliers consider fate of military-grade tactical gear". The Guardian. ISSN 0261-3077. Retrieved 2017-04-26. ^ Johnson, Sydney (2013-09-25). "Oakland Council Gets Earful Over 'Urban Shield' War Games". East Bay Express. Retrieved 2016-05-04. ^ "Oakland Mayor: City Will Not Host Urban Shield Conference Next Year". NBC Bay Area. 2014-09-06. Retrieved 2016-05-04. ^ "Alameda County Sheriff's Office - Criminalistics Laboratory". Archived from the original on 2007-12-16. Retrieved 2007-12-31. ^ "Alameda County Sheriff's Office - Coroner's Bureau". Archived from the original on 2007-12-18. Retrieved 2007-12-31. ^ Hernandez, Jodi (2013-02-14). "Alameda County Sheriff Pitches Drones to Supervisors". NBC Bay Area. Retrieved 2016-05-04. ^ "ACAD | Alameda County Against Drones | Page 2". Nomby.wordpress.com. Retrieved 2016-05-04. ^ "Alameda County: Drone meeting ends with no resolution - EastBayTimes.com". Contracostatimes.com. Retrieved 2016-05-04. ^ Scherr, Judith. "Berkeley group eyes new sheriff, district attorney - EastBayTimes.com". Insidebayarea.com. Retrieved 2016-05-04. ^ "Bay Area Public Employee Salaries 2012 - San Jose Mercury News". Mercurynews.com. Retrieved 2016-05-04. ^ "2 Alameda deputies facing charges over taped beating in SF". KTVU. May 10, 2016. Sheriffs from 1853 to 1883 - "History of Alameda County", M.W. Wood, 1883.